National Priorities Project updates trillions in tax breaks, who benefits, and why it matters for you. The federal tax code includes hundreds of tax breaks (called tax expenditures within the federal government) meant to encourage activities that lawmakers deem beneficial to society. From the perspective of the government, tax breaks are no different from any other kind of government spending. In both cases, the U.S. Treasury has less money, and a government activity – whether subsidies for home buying, repairs to an interstate highway, or tuition support to college students – receives funding. 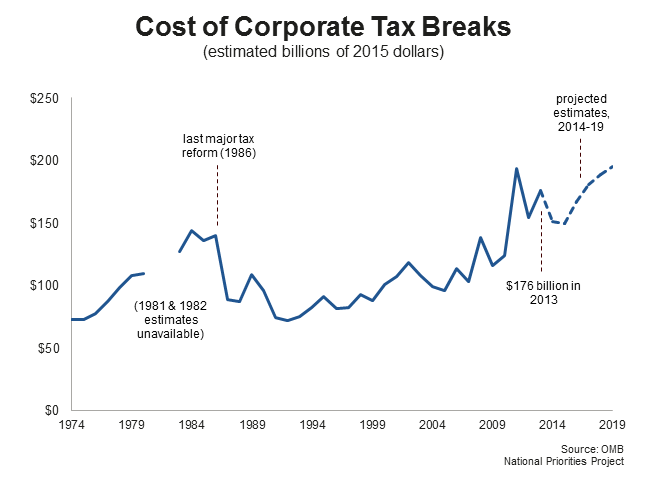 In 2013, the cost of tax breaks was equal to the entire U.S. discretionary budget . However, the discretionary budget is subject to an annual appropriations process, where Congress debates the proposed spending. Tax breaks, on the other hand, remain on the books until lawmakers modify them. As a result, over a trillion dollars a year in lost revenue – more than 1.6 times the 2013 budget deficit – goes largely unnoticed. Tax breaks deserve just as much oversight and public attention as the rest of the federal budget. Every dollar the government spends on a tax break is a dollar it can’t spend elsewhere – whether on early-childhood education, environmental protection, or infrastructure improvements. Yet few Americans are aware of how much spending occurs through the tax code or who benefits. Places limits on tax deductions for top income earners and implements Buffett Rule to collectively raise $651 billion over 10 years. Ends the “carried interest” loophole that benefits hedge fund managers and eliminates special tax breaks for corporations (raises $13.8 billion over 10 years). Plans to close tax loopholes to simplify the tax code but does not specify which ones. Places limits on tax deductions for top earners. Limits corporate loopholes for stock options, executive bonus pay, jets, and meals and entertainment to raise $153 billion over 10 years. Also eliminates the home mortgage-interest deduction for vacation homes and yachts to raise $14 billion over 10 years. You have the opportunity to influence this process by communicating with your legislators about what you believe should be done. Are certain tax breaks important to you? Do you believe some tax breaks should be eliminated from the tax code? This is your opportunity to influence Washington. Take Action. Interactive Visualization: See the cost of tax breaks, how they’ve changed over time, and who benefits. Complete Data on Tax Breaks: Download data and explore the cost of every tax break every year from 1974 to the present. Federal Budget 101: Understand who decides the federal budget, where the money comes from, and where it goes. Numbers updated April 2014 to reflect the latest Treasury Department tax break estimates. Unless otherwise noted, all numbers are drawn from the White House Office of Management and Budget, Analytical Perspectives, Chapter 14: Tax Expenditures, Fiscal Year 2015 and are adjusted to FY 2015 dollars. Tax break estimates reflect foregone revenue but do not necessarily represent the amount of additional revenue the government would raise by repealing any given tax expenditure. Congressional Budget Office, The Distribution of Major Tax Expenditures in the Individual Income Tax System, http://www.cbo.gov/publication/43768. Note that CBO’s report on distributional effects draws on tax expenditure estimates from the Joint Committee on Taxation, while the estimates reported here are those produced by OMB.